As you may well have noticed, sour beer styles are becoming rather popular, at least inside the beer bubble. It's an area in which Moon Dog has played around since day dot, opening its account with beers including the barrel aged wild black ale Perverse Sexual Amalgam and following soon after with Mr Mistoffelees. Yet, while they've continued to play silly buggers on their original brew kit, with the big new beast next door charged with keeping the Beer Can, Old Mate and co flowing, their sour side has been kept relatively in check. But, as the summer of sour starts to warm up, they're joining the party. As with most gose and Berliner weisse style beers hitting the market right now, it's a fruited affair too, with peach and plum the weapons of choice. 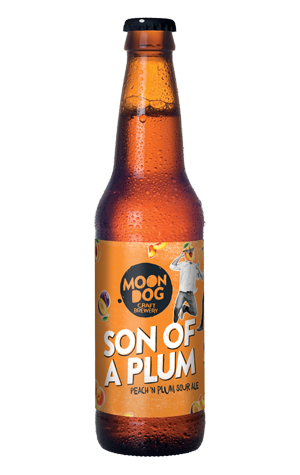 But, where many contemporary beers in this arena seem to favour leading off with the fruit and keeping the sour side of things in the background – not a daft idea when trying to bring new drinkers into the fold – Son Of A Plum instead wades knee deep into the acidic waters marked "pucker" and "funk", with the lactobacillus delivering both as well as adding a creaminess to the body. The peaches and plums contribute in a tangy-juice-squeezed-from-their-flesh manner more than aromatically in a beer that, while stopping well short of intense pucker action, should keep those who don't want their sourness softened sated this summer.